Brenda Gayle Plummer (Editor). 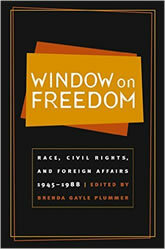 Window on Freedom: Race, Civil Rights, and Foreign Affairs, 1945-1988. University of North Carolina Press, 2003. The civil rights movement in the United States drew strength from supporters of human rights worldwide. Once U.S. policy makers–influenced by international pressure, the courage of ordinary American citizens, and a desire for global leadership–had signed such documents as the United Nations charter, domestic calls for change could be based squarely on the moral authority of doctrines the United States endorsed abroad. This is one of the many fascinating links between racial politics and international affairs explored in Window on Freedom. Broad in chronological scope and topical diversity, the ten original essays presented here demonstrate how the roots of U.S. foreign policy have been embedded in social, economic, and cultural factors of domestic as well as foreign origin. They argue persuasively that the campaign to realize full civil rights for racial and ethnic minorities in America is best understood in the context of competitive international relations. The contributors are Carol Anderson, Donald R. Culverson, Mary L. Dudziak, Cary Fraser, Gerald Horne, Michael Krenn, Paul Gordon Lauren, Thomas Noer, Lorena Oropeza, and Brenda Gayle Plummer.